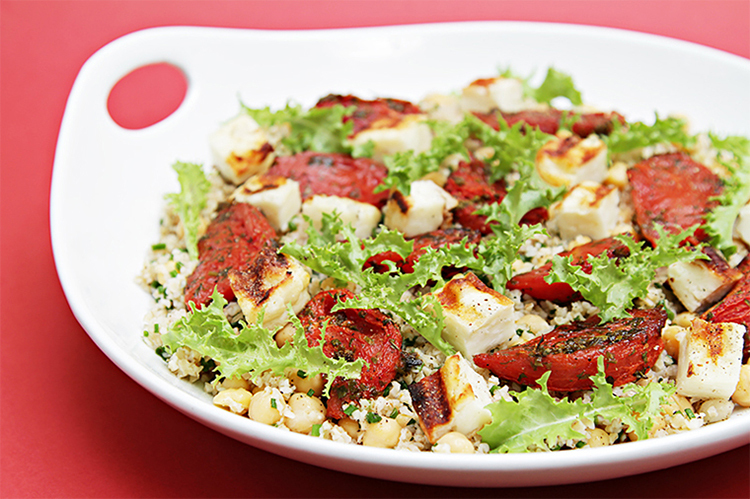 The nutty bulgur and robust chickpeas are tossed with a lemony vinaigrette and loads of fresh chives, then topped with fresh roasted tomato slices and chewy, grilled halloumi cheese. 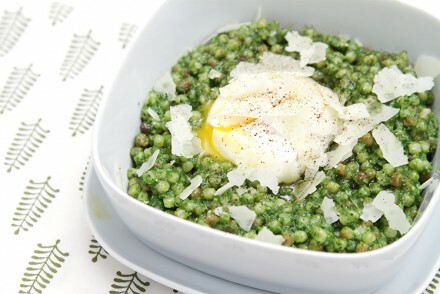 The combination is absolutely delightful and makes for a satisfying, light main course. But you could also serve it as a side dish or as part of an antipasti. Serve a dry rosé, preferably made with Pinot Noir grapes. These rosés pair splendidly with the zingy bulgur mixture and roasted tomatoes, while highlighting the salty, chewy halloumi. 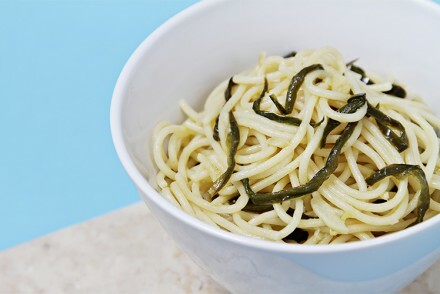 Step 1: To make the vinaigrette – Place the lemon juice, oil, salt and pepper in a small bowl and whisk until well blended. Set aside. Step 2: Place the bulgur in a medium bowl and top with plenty of boiling water. Let stand for 30 minutes until soft and fluffed up. Step 3: Place the halloumi on paper towels and blot dry. Then brush the slices with the olive oil on both sides. Preheat grill or griddle to high heat. Brush grill rack or griddle with the balance of the olive oil. Grill slices until grill marks appear. Turn the slices over, being careful not to break them (the cheese will have begun to melt! ), and grill until charred. Place on a tray and let cool for a few minutes. Then cut in 1/2″ cubes. Step 4: To assemble the dish – Drain the bulgur and shake to remove excess water. Place in a large bowl. Add the chickpeas and chives. Drizzle with the vinaigrette and toss well. Spread the bulgur mixture on a serving platter. 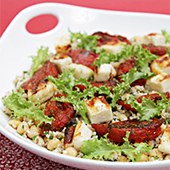 Top with the roasted tomatoes and the grilled halloumi. 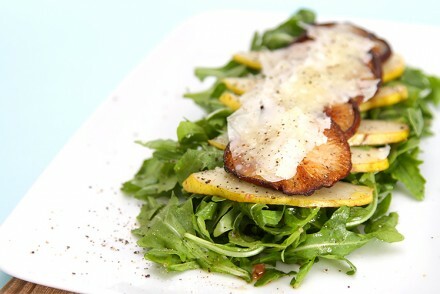 Garnish with the frisée and finish with black pepper. Serve immediately. Big and fresh flavours! 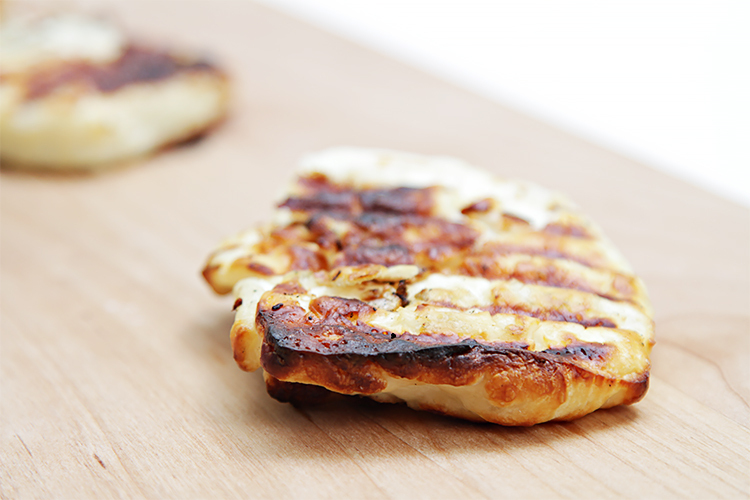 I love those grilled halloumi!